Written by: Other Writer on April 12, 2019. The sanctions regime does allow for humanitarian assistance. The United States has imposed unilateral sanctions on North Korea that restrict more economic activities and target a larger list of individuals and businesses than the UN sanctions. They are primarily designed to impede Pyongyang’s development of missile and nuclear technology. Additionally, the US has sanctioned banks, companies and individuals outside North Korea – particularly in China and Russia – for supporting its weapons programme. From 1988 to 2008, the United States labelled North Korea a state sponsor of terrorism, an official designation that placed another layer of sanctions on the regime. President George W. Bush removed North Korea from the list as part of denuclearization negotiations, but in November 2017 President Trump announced he would return North Korea to the list. The U.S. Congress passed its first statute imposing sanctions on North Korea in 2016, adding to those that had already been levied by successive presidents. The law requires the president to sanction anyone involved in activities such as the proliferation of weapons of mass destruction. An additional piece of legislation, the Countering America’s Adversaries Through Sanctions Act, passed in 2017, imposes further sanctions on North Korea (as well as on Iran and Russia). It prohibits certain types of US assistance to foreign governments that aid North Korea. During his first year in office, President Trump authorized the Treasury Department to block from the US financial system any foreign business or individual that facilitates trade with North Korea as part of the administration’s “maximum pressure” campaign. US allies Japan and South Korea, as well as the European Union, have also sanctioned North Korea beyond the measures imposed by the UN Security Council. Some South Korean leaders including the current president, Moon Jae-in, have opted for a more conciliatory approach, attempting to expand bilateral exchanges as a path toward peaceful coexistence. Seoul provided Pyongyang $7 billion in aid between 1991 and 2015, often as food and medical assistance. 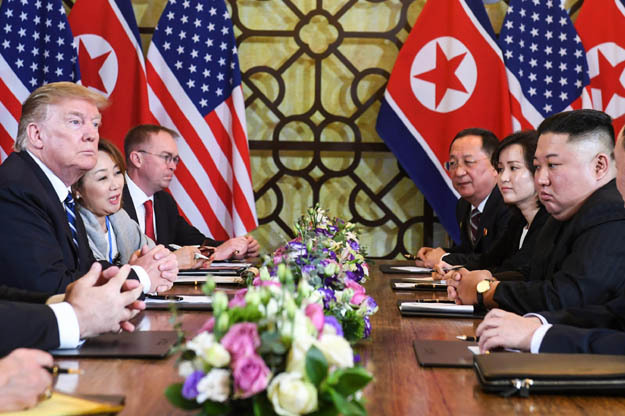 Moon, while supporting international sanctions and enhanced defence cooperation with the United States, has worked to improve North-South ties, meeting with Kim four times. Japan has also restricted commercial and diplomatic exchanges with North Korea, imposing sanctions starting in 2006. It lifted some of them in 2014 to induce Pyongyang to investigate the disappearances of Japanese nationals in the 1970s and 1980s. Japan imposed new sanctions in February 2016, and again in August and December 2017, in response to North Korean nuclear and missile tests. These measures freeze certain North Korean and Chinese assets, ban the entry of North Koreans, and prohibit remittances worth more than $880. The EU’s supplemental economic restrictions ban the admission and residency of people who have facilitated North Korea’s weapons programme, deny North Koreans access to specialized training, prohibit the export of luxury products ranging from purebred horses to ski equipment, ban EU investment across North Korean economic sectors, and cap remittances to North Korea. This post has been seen 293 times.